When the first Adidas F50 Adizero was released in 2010 it left a good impression as many big stars wore the boot in World Cup 2010 South Africa. 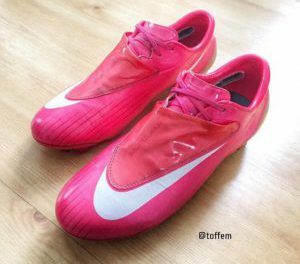 Players like Messi, Suarez, Bale and Robben wore the boots. The new Adizeros were available in synthetic and leather. New design in the upper “Sprintweb” gave better stability in high speed. The new upper “Sprintskin” was made of a single layer which minimized the weight. Adidas F50 Adizero weighted 165g. So the revolutionary about the Adizeros that were released in 2012 was a chip called “miCoach”. It´s a speed cell that was fitted into the outsole of one of the boots. You could download the App and follow your progress after every game or practice. The miCoach speed cell calculated for example the distance covered and top speed.